English naturalist and broadcaster whose distinguished career in broadcasting spans more than a half-century. His Zoo Quest television series that began in 1952 ran for ten years, and was just the beginning of a life-long passion for presenting natural history television series from all parts of the world. 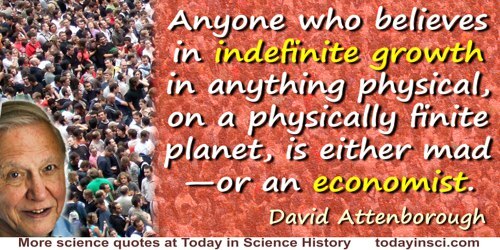 Anyone who believes in indefinite growth in anything physical, on a physically finite planet, is either mad—or an economist. Expressing concern about ecosystems ruined by the arrival of man. As quoted by Philip Maughan, 'Sixty Years of Attenborough Through the Eyes of the New Statesman', New Statesman (21 Dec 2012), 141, No. 5138, 34. 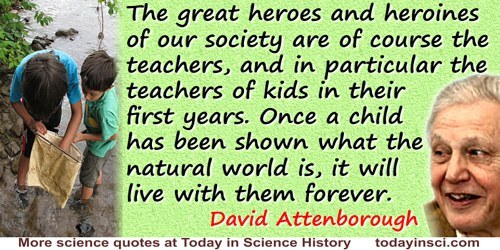 The quote came from Attenborough writing in an April 2013 issue of the same periodical. 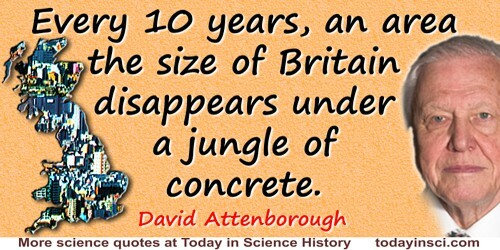 Every 10 years, an area the size of Britain disappears under a jungle of concrete. 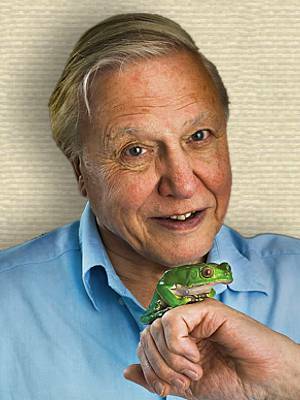 As quoted from BBC TV series, Planet Earth II in Joe Shute, 'David Attenborough at 90: ‘I think about my mortality every day’', The Telegraph (29 Oct 2016). I grew up in Leicestershire, in Leicester, which is on the Jurassic, and it’s full of lovely fossils. Ammonites, belemnites, brachiopods—very beautiful. How did they get there, in the middle of the rocks, in the middle of England, and so on? And I had the collecting bug, which I still have, actually, which is the basis of so much of natural history, really, and so much of science. And so collecting all these things, and discovering what they were, and how they lived, and when they had lived, and all that, was abiding fascination to me from the age of I suppose about eight. And I still feel that way, actually. Speaking about fossils that first inspired his love of natural history. 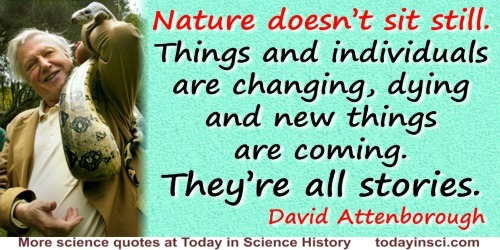 In video by Royal Society of Biology, 'Sir David Attenborough, Biology: Changing the World Interview,' published on YouTube (13 Feb 2015). I have never really had dreams to fulfil…. You just want to go on looking at these ecosystems and trying to understand them and they are all fascinating. To achieve a dream suggests snatching a prize from the top of a tree and running off with it, and that’s the end of it. It isn’t like that. … What you are trying to achieve is understanding and you don’t do that just by chasing dreams. From interview with Michael Bond, 'It’s a Wonderful Life', New Scientist (14 Dec 2002), 176, No. 2373, 52. I have no doubt that the fundamental problem the planet faces is the enormous increase in the human population. You see it overrunning everywhere. Places that were very remote when I went there 50 years ago are now overrun. If I were working in astrophysics I would find it quite hard to explain to people what I was doing. Natural history is a pretty easy thing to explain. It does have its complexities, but nowhere do you speak about things that are outside people’s experience. You might speak about a species that is outside their experience, but nothing as remote as astrophysics. If my legs give up, they give up. 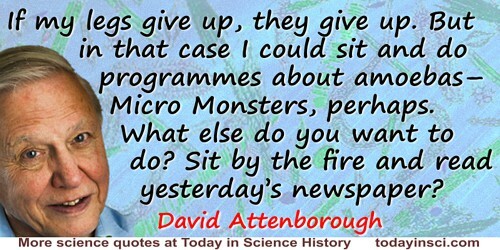 But in that case I could sit and do programmes about amoebas—Micro Monsters, perhaps. What else do you want to do? Sit by the fire and read yesterday’s newspaper? Stating his intent to never retire. Reported by Adam Lusher in 'Sir David Attenborough', Daily Mail (28 Feb 2014). If we [humans] disappeared overnight, the world would probably be better off. Interview about Life In The Undergrowth (book and TV series on insects), The Daily Telegraph (12 Nov 2005). In a great number of programmes I’m not a scientist—I’m simply a commentator. So I should claim no virtue for the fact that [people] seem to trust me, if that is indeed the case. It’s simply that I very seldom talk about something they can’t see. If I say a lion is attacking a wildebeest, they can see it is; if I were to say something about a proton, it might be different. 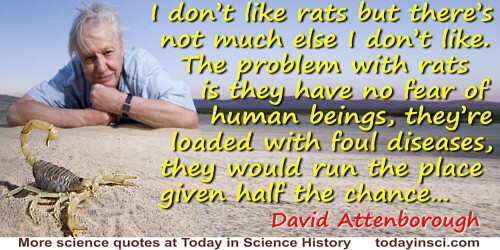 As quoted in Bill Parry, 'Sir David Attenborough in Conversation', The Biologist (Jun 2010), 57, No. 2, 93. In my position you can’t go out and just say, “I think,” because it’s a very serious thing. So if you get up and say climate is changing because of CO2 emissions, you better bloody well be right. 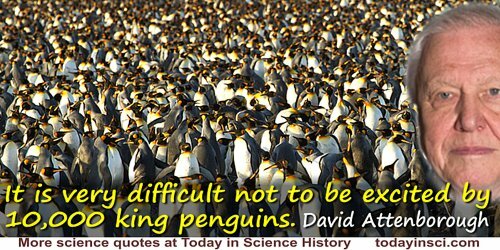 It is very difficult not to be excited by 10,000 king penguins. 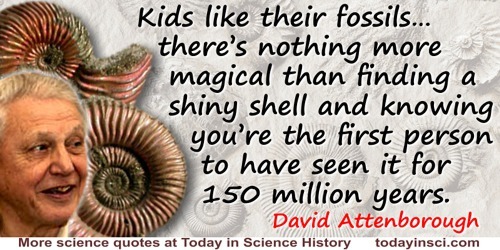 Kids like their fossils. I’ve taken my godson fossil-hunting and there’s nothing more magical than finding a shiny shell and knowing you’re the first person to have seen it for 150 million years. Nature doesn’t sit still. Things and individuals are changing, dying and new things are coming. They’re all stories. From interview with Joe Shute, 'David Attenborough at 90: ‘I think about my mortality every day’', The Telegraph (29 Oct 2016). 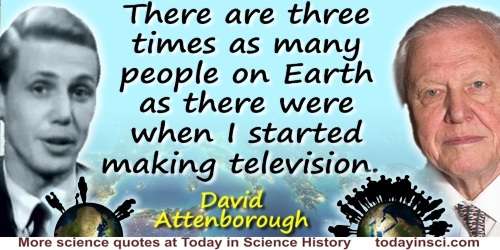 There are three times as many people in the world as when I started making television programs 56 years ago. It is frightening. We can’t go on as we have been. We are seeing the consequences in terms of ecology, pollution, space and food production. On becoming a patron of the Optimum Population Trust, as reported in The Times (14 Apr 2009). 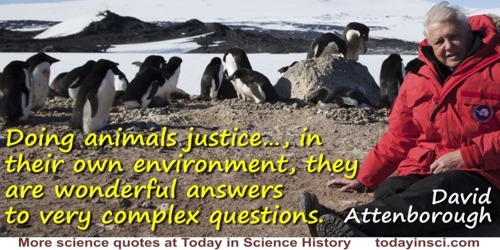 Yes, we have to [do more to prioritise animals and the environment over human activity]. There are whole areas—the rainforest, for example—that have to be protected for the animals and for the whole of the climate of the planet. That’s a priority if ever there was one. [A key to success] is being able to talk to camera without a teleprompter. … If you believe something and want to make clear what you are talking about, you ought to be able to articulate it without a teleprompter. ~~[Orphan]~~ The question is, are we happy to suppose that our grandchildren may never be able to see an elephant except in a picture book? 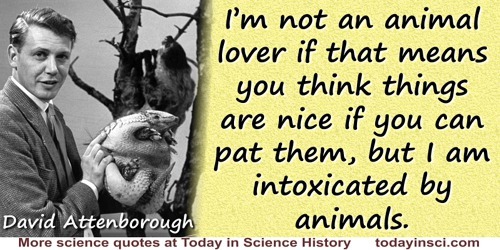 Appears in various online sources attributed to David Attenborough, but always with no citation. No primary source, so far, found by Webmaster.Perhaps it comes from one of the so many interviews and documentaries he has done for TV and radio. For now, Webmaster regards it as an orphan quote that needs a primary source. Or it might not be a quote of his, and best attributed to Anonymous. Can you help identify the primary source? 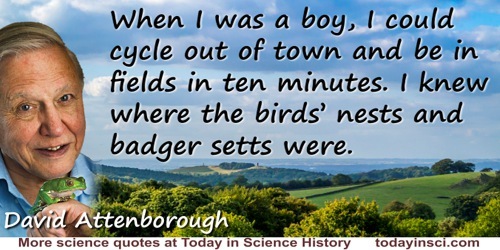 8 May - short biography, births, deaths and events on date of Attenborough's birth. Life on Air: Memoirs of a Broadcaster, by David Attenborough. - book suggestion.